A new drug for HIV patients developed by Skolkovo resident Viriom has been included on Russia’s list of vital and essential drugs (VED), meaning it will be available to patients and doctors across Russia under both federally and regionally funded programmes. A Russian Health Ministry commission included Elpida, Viriom's once-daily 20 mg oral formulation of its innovative drug elsulfavirine, on the list, the company announced last week. The new drug has demonstrated superior safety and tolerability over other antiretroviral medicines. Photo: ChemRar. 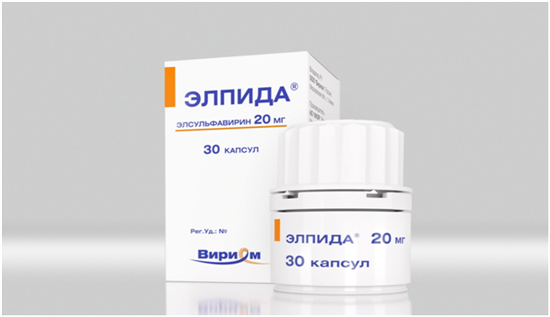 “Inclusion of Elpida™, Viriom's best in class non-nucleoside reverse transcriptase inhibitor (NNRTI), provides full access to the drug for all patients and physicians for HIV treatment and prophylaxis, and is chiefly funded under the Russian government's State Strategy and Implementation Plan on HIV until 2020 and beyond,” Viriom, which has offices in both Moscow and San Diego, said in a press release. The decision to list Elpida in VED paves the way for the quick adoption of Elpida as the preferred NNRTI standard of care by the regulatory and physician community, with strong support from patient organizations, said Viriom, whose Russian company is a resident of the Skolkovo Foundation’s biomed cluster. NNRTIs block HIV by inhibiting a key enzyme in virus replication. During preclinical and clinical development, elsulfavirine demonstrated a higher genetic barrier to the development of resistance-conferring viral mutations, as well as high efficacy and superior safety and tolerability over other antiretroviral medicines. Up to 1.5. million people – about 1 percent of the population – are estimated to be living with HIV in Russia. Viriom obtained its first Russian marketing approval for Elpida in June 2017 for treatment of HIV-1 in combination with other antiretroviral medicines. Viriom is launching Elpida, whose name means “hope” in Greek, in several developing markets, expecting to treat over 8,000 HIV patients in 2017-2018. Elsulfavirine has also demonstrated clinical pharmacology advantageous for the development of less frequent drug administration, and Viriom is developing treatment routines in which daily pills can be replaced by longer lasting pills or injections. Such treatments are aimed at increasing patients’ adherence to treatment regimes, since taking a daily cocktail of pills can, in combination with unpleasant side effects from some older drugs, over time result in the patient developing a psychological aversion to treatment. Viriom was awarded a grant of 190 million rubles ($2.7 million) from the Skolkovo Foundation in March 2016 to develop this kind of prolonged therapy. Elpida and elsulfavirine-based fixed dose combinations and elsulfavirine once weekly dosing regimen are currently undergoing market registration and development in several countries including Thailand, countries of the Eurasian Economic Union and the U.S., the company said. Viriom’s drugs for Russia, Belarus and Kazakhstan are manufactured entirely in Russia, Ron Demuth, CFO of Viriom, Inc, told Sk.ru, meaning Russian patients are guaranteed unhindered access to the new drug. Currently, patients complain of shortages and delays in getting some foreign-made HIV medicines. Up to 1.5. million people – about 1 percent of the population – are estimated to be living with HIV in Russia, but only about a third of them are receiving treatment for the disease, according to Avert, a U.K.-based organisation devoted to HIV education. Unlike in many other countries, where new cases of HIV are on the decline, in Russia the HIV epidemic continues to grow by 10 to 15 percent every year.